It was on January 9: the first full moon of 2012. The Pleiades satellite was there to immortalize the event, not only for the beauty of the show but because the Moon is a very interesting "target" for its in-orbit activities : free from atmospheric disturbances, it is possible to finely calibrate the instrument optical Pleiades on the seas and lunar craters. Best of all, Pleiades has also achieved a first by taking, thanks to its agility, two stereo images of the visible face of the Moon: so here the first three-dimensional image of our natural satellite from an observation satellite Earth! The two images were taken while the satellite Pleiades occupied two diametrically opposed positions on its orbit at 694 km altitude: two views separated by nearly 14100 km. It is this gap that creates the differences between the red and cyan, which allows you, with appropriate spectacles, to see the Moon in 3 dimensions. This parallax effect of the difference of views, is known since ancient astronomy: the Greeks (Aristarchus, Eratosthenes, Hipparchus, Ptolemy) used this method to measure the distance between objects in the solar system and stars. In 1751, 'l'abbé' de Lacaille and Joseph de Lalande, in Berlin and Cape Town, performed the first accurate measurement of distance from the Earth to the Moon. Note: Due to shooting conditions and to use the 3D glasses, the image is rotated 90 ° from the representation "usual" of the Moon: the large crater Tycho Brahe, right here, is well located in the southern hemisphere of the Moon. 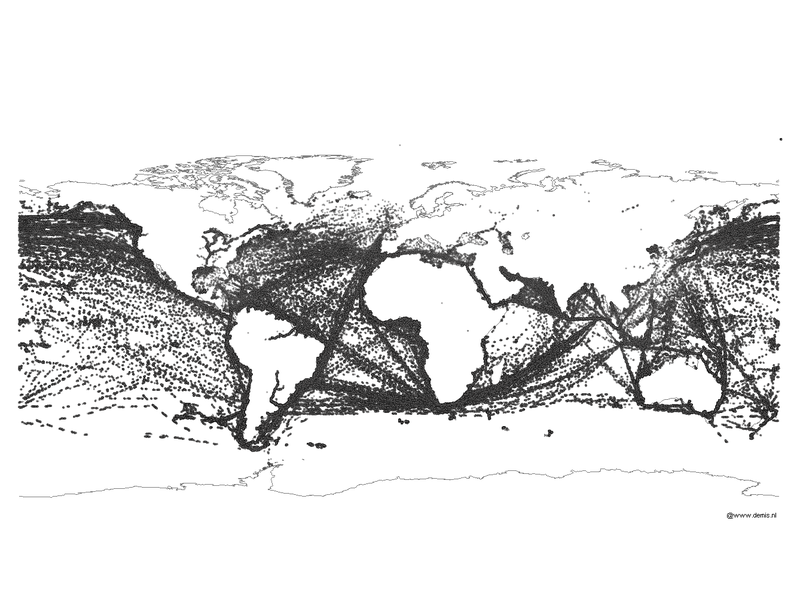 As the International Space Station circles Earth, it has been tracking individual ships crossing the seas beneath. An investigation hosted by the European Space Agency (ESA) in its Columbus module has been testing the viability of monitoring global maritime traffic from the station's orbit hundreds of miles (kilometers) above since June 2010. The COLAIS experiment with NORAIS receiver was switched on on 1 June 2010. 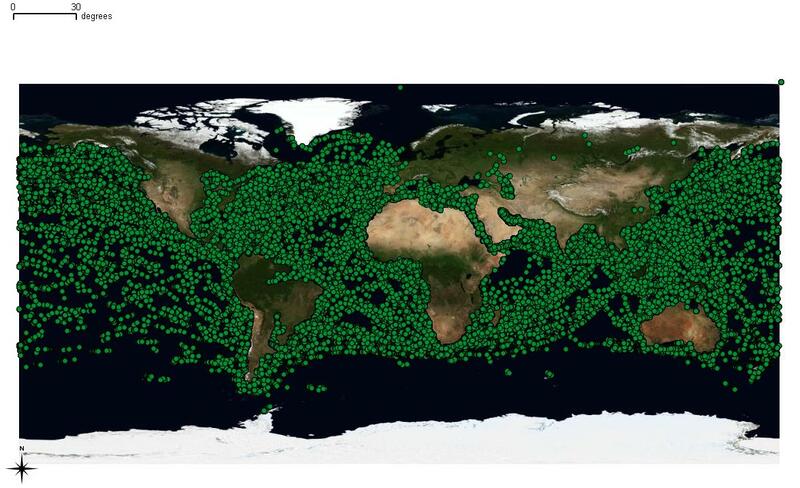 More than 90 000 Class A AIS messages were gathered by between 1900 GMT on 2 June and 0900 GMT on 3 June. AIS allows port authorities and coast guards to track seagoing traffic, but the system relies on VHF radio signals with a horizontal range of just 40 nautical miles (74 km). This makes it useful within coastal zones and on a ship-to-ship basis, but not in the open ocean; ocean traffic was largely untracked. However, AIS signals travel much further vertically, making the space station an ideal location for space-based AIS signal reception and, therefore, providing the capability of tracking global maritime traffic from space. 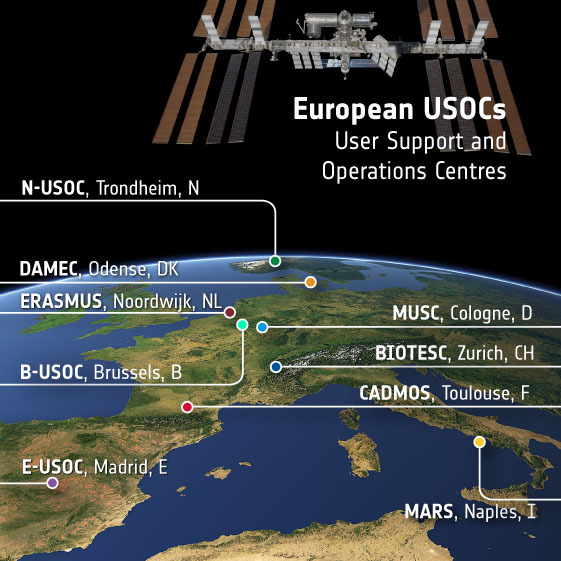 Astronauts were instrumental in enabling the COLAIS experiment, which is an in-orbit demonstration project of ESA's General Support Technology Program. Columbus was not originally outfitted with VHF antennas to capture the AIS signals; they were installed on the outside of the module during a spacewalk in November 2009, with the remaining piece of hardware, the ERNO-Box control computer, installed inside Columbus along with the NORAIS receiver in May 2010. The ERNO-Box is itself an orbital demonstration of a new class of space computer developed by Astrium Gmbh, Germany. Astrium was responsible for overall system integration, and contributed the ERNO-Box and a grappling adaptor, or GATOR, used to attach the AIS antenna to Columbus. Antennas were built by AMSAT. Video indicating the vastly improved coverage area obtained using satellite based AIS base stations. The AIS ground coverage from the station is between approximately 68° north and 68° south. 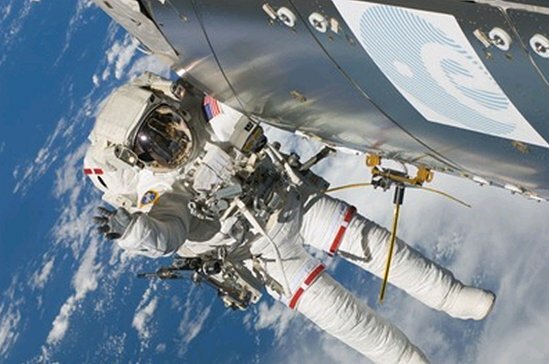 The system consists of two antenna assemblies that were mounted on the outside of Columbus during a spacewalk in November 2009 as well as data relay hardware (the ERNO-Box) and a receiver mounted inside Columbus. The two operational phases with the first receiver from Norway,or NORAIS, which is operated by FFI/Norway, have been extremely successful, with data telemetry received by the Norwegian User Support and Operation Center, or N-USOC, in Trondheim, Norway, via ESA's Columbus Control Center in Germany. Data has been received by NORAIS in almost continuous operation, and all modes of operation have worked extremely well. The NORAIS Receiver has a sample mode that can collect the raw signal, digitize it and send it to ground for analysis of signal quality, which is proving very helpful in making additional improvements/ refinements to the system in extremely crowded shipping areas where the possibility of lost signals or mixed signals can occur. This is used both to investigate the signal environment and to evaluate the performance of new receiver technologies on the ground. Several hundred data sets have been collected and processed with new candidate algorithms for next generation receivers. The results of the analyses have been very good. On a good day, approximately 400,000 ship position reports are received from more than 22,000 different ship identification numbers (Maritime Mobile Service Identity, or MMSI). In a summary made in Oct. 2011, the total number of position reports received exceeded 110 million messages from more than 82,000 different MMSI numbers. As an addition to the original technical topics, operational experimentation has been included in the investigations. 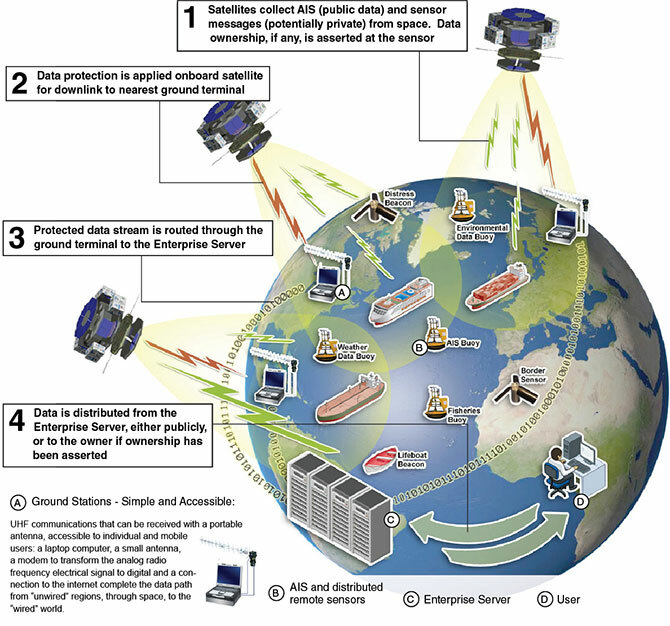 Near-real-time data transfer is crucial to meet the requirement of SAT-AIS set by ESA in cooperation with operational users. After an upgrade of the ground systems in the N-USOC, 10 days of near-real-time data show that 80 percent of the messages collected in the period could be delivered through the station's communications network with data latency significantly less than 1 hour. The near-real-time data delivery has been part of routine operations since Nov. 2011. At present, a new version of the decoder algorithm, developed by Kongsberg Seatex as part of the technology development contract with ESA, is being tested. The development benefits from the investigations of the sampled data and ongoing work in other ESA projects. The firmware was uploaded to the NORAIS Receiver through the station's communications network and verified and activated in Jan. 2011. The preliminary results indicate that the performance in terms of decoded messages has increased by a factor of between 1.5 and 2.0 for the high traffic zones that ESA has specified should be monitored with high performance. The work on better algorithms continues. A second NORAIS Receiver upgrade is planned in May 2012. The results of the development will support the design and development of a space-based AIS system in general as well as the performance of the AIS receiver on the station. The video shows an in-context view of AIS data collected from the AprizeSat-3 microsatellite owned and operated by SpaceQuest, Ltd. The data was collected on 11 September 2010. The video covers several segments in a 12-hour period between midnight and noon, GMT. Playback is set at about 48 times faster than realtime. AIS packets received from ships are shown by red dots, which persist for 30 seconds realtime (~1.25 seconds sim time). Therefore, ships that are transmitting AIS data frequently tend to persist in the view. The Field of View (FOV) of the satellite is shown by a white circle - this effectively denotes the perceived satellites horizon. The low Earth orbtiing satellite can only receive ships within the FOV. Integrating AIS information with other satellite data, such as information from remote-sensing satellites, should significantly improve maritime surveillance and boost safety and security at sea. 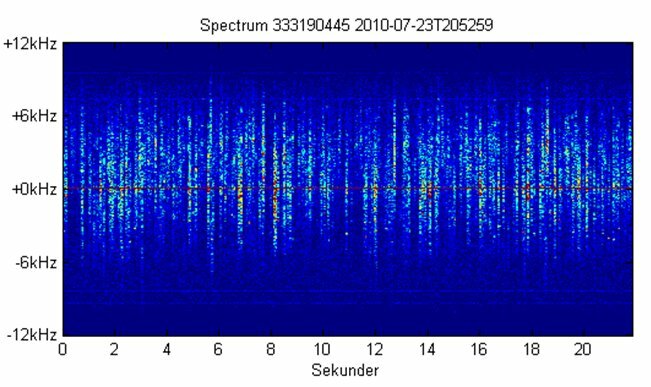 The payload designed for the Norwegian AISSat-1 satellite, which launched into a near polar orbit in July 2010, provides similarly good data in the high north. The NORAIS Receiver is software-defined radio design operating across the maritime band from 156 to 163 megahertz. The tuning of the NORAIS receiver to frequencies under consideration for allocation to space-based AIS has been carried out, and NORAIS took part in international tests of these two proposed frequencies in October 2010 as arranged by U.S. Coast Guard. The main reason for covering more than the two current frequencies in use for AIS is to have the possibility to demonstrate the operational use of new channels in the maritime band being allocated to space-based AIS. Also, this configuration allows for characterization of the maritime VHF spectrum with respect to occupancy and interference. The software implementation allows for optimization of the receiver settings in orbit and also allows for upload of new signal processing algorithms. The Vessel Identification System, or VIS, could potentially be beneficial to many European entities, particularly in assisting them in law enforcement, fishery control campaigns, maritime border control, maritime safety and security issues, including marine pollution surveys, search and rescue and anti-piracy. Various service entities have already been asking to get access to the VIS data, which is continuously acquired on Columbus. This NASA map shows the size of aerosol particles in the atmosphere. Green areas indicate larger, more naturally occurring particles like dust. Red areas indicate smaller aerosol particles, which can come from fossil fuels and fires. Yellow areas indicate a mix of large and small particles. Scientists want to know why that is, especially because these temperature shifts affect the weather. New research suggests that human activity is part of the cause. And that may be part of it. Aerosols are fine particles like soot or sulfur compounds, mostly from burning fuel. They seed a kind of cloud that's especially good at reflecting solar radiation back into space. Even on their own, without clouds, these aerosols act like sunblock. "If you combine the role of volcanic activity and the human emissions of aerosols, we account for 76 percent of the total variation in sea surface temperature in our study," Booth says. Booth and his colleagues aren't the first to propose that aerosols influence sea surface temperatures. But climate scientist Amato Evan at the University of Virginia says they've done the most thorough job to date of tracking and confirming those changes. Surface temperatures around the Atlantic influence the amount and timing of rainfall in West Africa and the Amazon in South America, and whether there's drought there. They affect the number and strength of Atlantic hurricanes and even where hurricanes go. Booth used computer models to analyze a very complicated process — the interaction of ocean and atmosphere over many decades. The models' predictions didn't match all the changes people have actually observed in the Atlantic. The new research appears in the journal Nature. If it's confirmed, it could foretell a warmer Atlantic, because the aerosol pollution has apparently cooled the Atlantic some. But new pollution controls are reducing the amount of those aerosols — that's good for public health, but it also means the ocean loses its sunblock. ﻿During six dives in Alvin, the team collected sediments and samples of the corals and filtered the brown material off of the corals for analysis. “Collecting samples from the deep ocean is incredibly challenging, and Alvin is crucial to this kind of work,” said lead author, chemist Helen White of Haverford College. Added WHOI biologist Tim Shank, "We hope our continued monitoring of this site, including time-lapse imaging, will give us insight into the potential for long-term recovery." 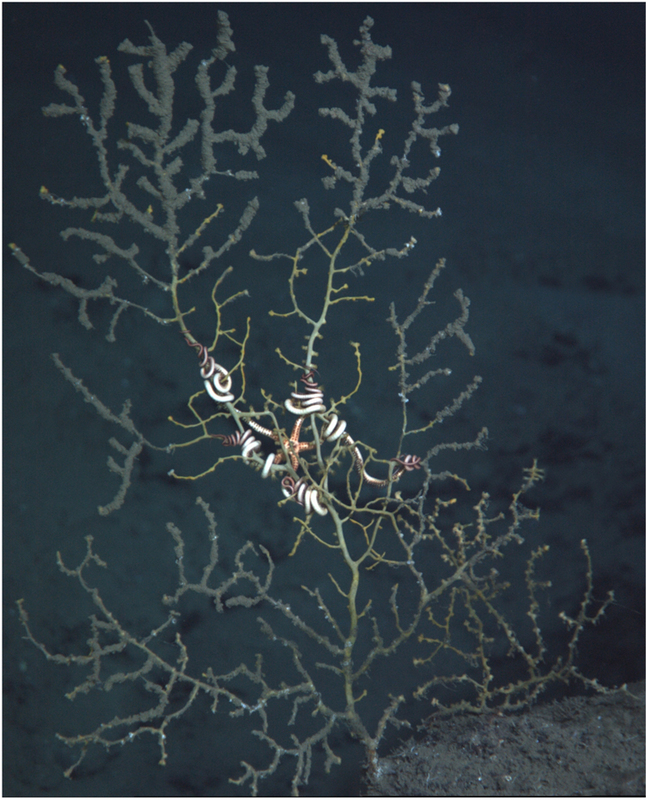 Six scientists from Woods Hole Oceanographic Institution (WHOI) have contributed to a new report finding "compelling evidence" that the Deepwater Horizon oil spill has impacted deep-sea coral communities in the Gulf of Mexico. 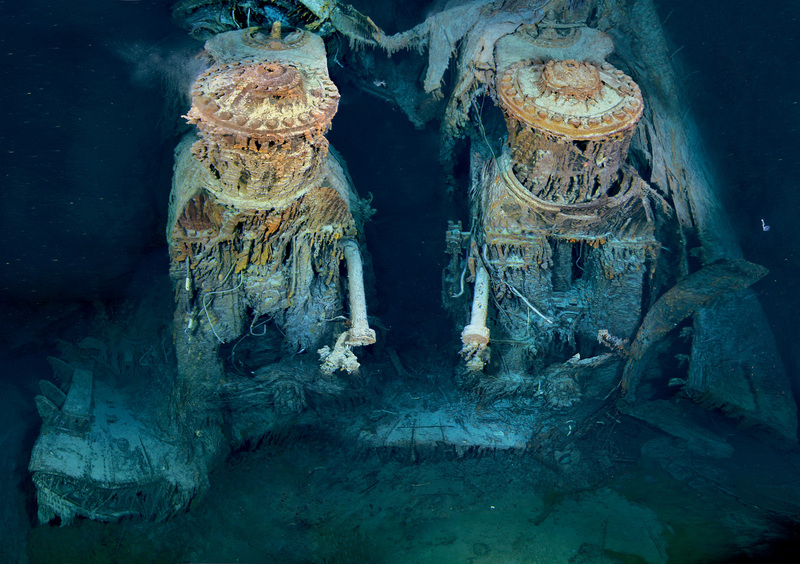 The study, published the week of March 26 in the journal Proceedings of the National Academy of Sciences USA, utilized all of the deep-sea robotic vehicles of the WHOI-operated National Deep Submergence Facility—the three-person submersible Alvin, the remotely operated vehicle (ROV) Jason, and the autonomous vehicle Sentry – to investigate the corals, and employed comprehensive two-dimensional gas chromatography to track the source of petroleum hydrocarbons found. “These corals exhibited varying levels of stress, from bare skeleton, tissue loss, to excess mucous production, all associated with a covering of brown flocculent material,” said Tim Shank, a WHOI biologist and an expert in life in the deep ocean. The study grew out of a previously scheduled research cruise to the Gulf led by Fisher in late October 2010—approximately six months after the Deepwater Horizon oil spill. This expedition was part of an ongoing study funded by the Bureau of Ocean Energy Management and the National Oceanic and Atmospheric Administration’s Ocean Exploration and Research program. Using the ROV Jason, the team examined nine sites 20 km from the Macondo well and found deep-water coral communities unharmed. However, when the ROV explored an area 11 km to the SW of the spill site at a depth of 4,300 feet, the team was surprised to discover numerous coral communities covered in a brown flocculent material and showing signs of tissue damage. “When we sampled small parts of these corals, some of the tissue sloughed off. We’d never seen anything like this,” said Shank. Joining this second research cruise, again headed by Fisher, was Helen White, whose expertise as a geochemist was key to the interdisciplinary effort. 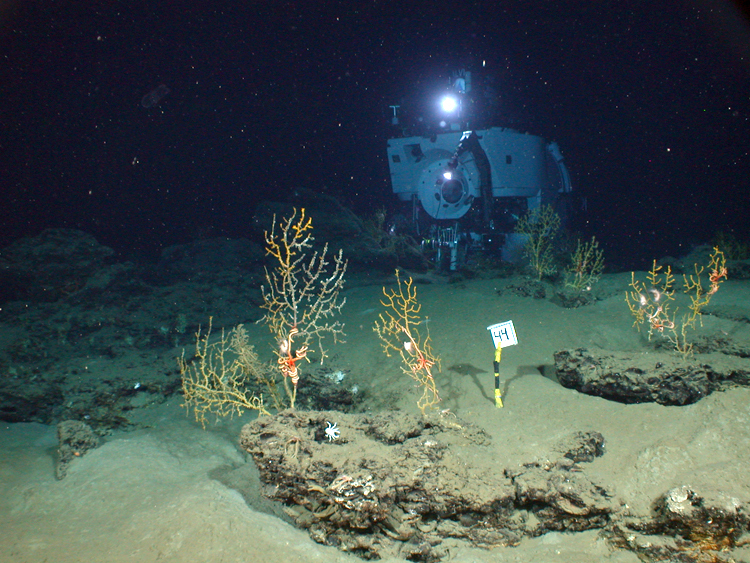 “It is easy to see the impact of oil on surface waters, coastlines and marine life, but this was the first time we were diving to the seafloor to examine the effects on deep sea ecosystems,” said White. “This research drew upon all the resources of the National Deep Submergence Facility to complete the work,” said Chris German, the chief scientist for deep submergence at WHOI. “This is a great exemplar of why we need such a diverse array of assets, not just for fundamental research but also to enable scientists to respond, rapidly, independently and objectively, at a time of national need." During six dives in Alvin, the team collected sediments and samples of the corals and filtered the brown material off of the corals for analysis. “Collecting samples from the deep ocean is incredibly challenging, and Alvin is crucial to this kind of work,” said White. Because oil can naturally seep from cracks in the sea floor of the Gulf, pinpointing the source of petroleum hydrocarbons in Gulf samples can be challenging to scientists, especially since oil is comprised of a complex mixture of different chemical compounds. However, there are often slight differences in oils that can be used to trace their origin. 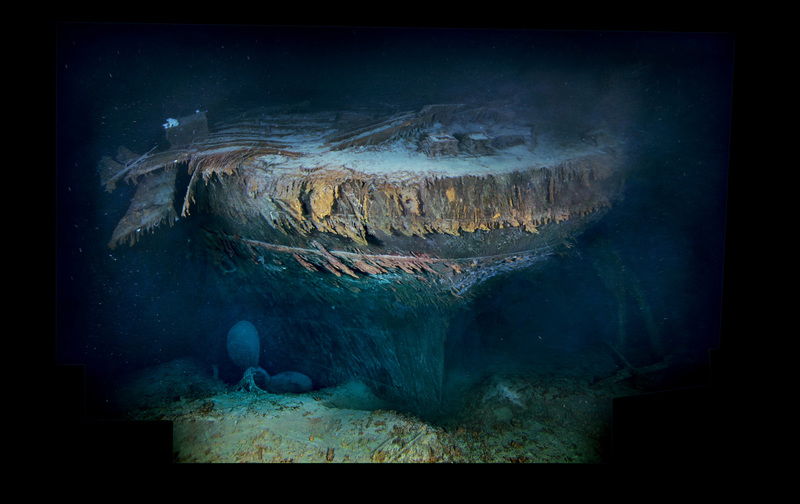 To identify the oil found in the coral communities, White worked with WHOI marine chemist Christopher Reddy and research specialist Robert Nelson using an advanced technique called comprehensive two-dimensional gas chromatography, which was pioneered at WHOI by Reddy and Nelson for use in oil spill research. The method provided invaluable evidence on the source of the oil. Reddy stated that he was interested in why and how far the oil travelled and spread along the seafloor. This result adds to other studies that have shown that the Deepwater Horizon disaster affected the seafloor, the seawater with plumes of hydrocarbon-rich water, surface slicks, and vapors in the atmosphere as well as oiled beaches and marshes. For every dollar American taxpayers spend on NOAA’s National Geodetic Survey (NGS) Coastal Mapping Program, they receive more than $35 in benefits, according to a recent independent socio-economic scoping study. The program provides critical baseline data for accurately mapping America’s official shoreline—important for national security, maritime shipping and navigation, and provides geographical reference data needed to manage, develop, conserve and protect coastal resources. The study demonstrates the program’s contributions in marine safety, geographic information, resource management, and emergency response and the wide range of economic and societal activities it supports. “This is a great investment for taxpayers,” said David Kennedy, assistant NOAA administrator for the National Ocean Service. Conducted by Leveson Consulting of Jackson, N.J., the study analyzed the benefits to the nation of NOAA’s Coastal Mapping Program, which enhances coastal economies by providing accurate and consistent shoreline data. Direct economic benefits of the program alone were estimated at $100 million—15 times program costs. The study estimated that NGS’s Coastal Mapping Program further supports 1,500 jobs outside of the program. In addition to the economic data, the study also provides information on the program’s customers and their uses of mapping data. NOAA collects aerial imagery used to improve the accuracy of shoreline data. NOAA derives the shoreline data through various remote sensing technologies including aerial imagery, satellite imagery, Light Detection and Ranging (LiDAR), and Synthetic Aperture RADAR (SAR). “In 2011, NGS delivered 7,800 miles of shoreline mapping that included 250 miles of California shoreline using new LiDAR-based procedures,” said Juliana Blackwell, NGS director. Join NOAA on Facebook, Twitter and our other social media channels. Even with a wetsuit on, any exposed flesh is quickly numbed and then the pain starts. It’s like having hundreds of sharp cold needles pierce your skin, compressing your chest until you forget you’re supposed to inhale. Panic sets in as your body reacts and then tries to adjust to the sudden change in temperature. Ahead of me in the water in Lough Hyne outside Skibbereen in west Cork, Steve Redmond is calmly giving me instructions. “Take small steady strokes. Get through the first few minutes and it will get easier,” he says. The water temperature is possibly six to eight degrees. Redmond is in a pair of speedos and a swim cap. Redmond points to an island in the mid-distance and says he swims around it when he is out here training properly. Some days he can be out here hours, getting his body used to low temperatures and pushing it to the limit of endurance. At the moment, he is in what he calls “recovery mode”. A few weeks ago, he finished his sixth channel swim, and is now on course to be the first person in history to complete the Ocean’s Seven challenge. The Ocean’s Seven challenge involves swimming the English Channel (between England and France), Cook Strait (between the north and south islands of New Zealand), Moloka’i Channel (between O’ahu and Moloka’i islands in Hawaii), North Channel (between Ireland and Scotland), Catalina Channel (in southern California), Tsugaru Channel (between islands of Honshu and Hokkaido in Japan) and the Strait of Gibraltar (between Europe and Africa). Redmond only has the Tsugaru Channel left to do and in early June, he will travel to Japan to attempt the final leg of this gruelling challenge and enter the record books. He has swum alongside sharks (“they’re like dogs, they just come for a look and go away again”) and through seas thick with jellyfish (“more dangerous than sharks and incredibly painful”). There were times his crew had to refuse him permission to leave the water, nights when he swam with commercial ferries sailing alongside and when huge swells meant a few hundred metres took him hours. Steve Redmonds launches his bid to become the first person to complete the Ocean's Seven swim challenge. Ocean's Seven is the marathon swimming equivalent of the mountain climbing challenge Seven Summits, though unlike that even Ocean's Seven has never been completed. Redmond swam from a young age and, in a past life, worked for a time as a commercial diver. He also played rugby and, after he retired, he wanted a new challenge. Now, with the help of a few dedicated friends and open-water enthusiasts, he is in a race with maybe a dozen other swimmers from around the world. Among them Redmond has possibly the best chance of completing the Ocean’s Sevens first. “In my life I haven’t done a whole lot of any bloody good except to get married and have a few kids,” he says frankly. In Hawaii a few weeks back, he almost didn’t make it. "The swim took 22 hours and 29 minutes and brought him to the limit of his physical endurance. The money for each swim has been raised locally – poker nights, getting his body waxed, favours from friends. 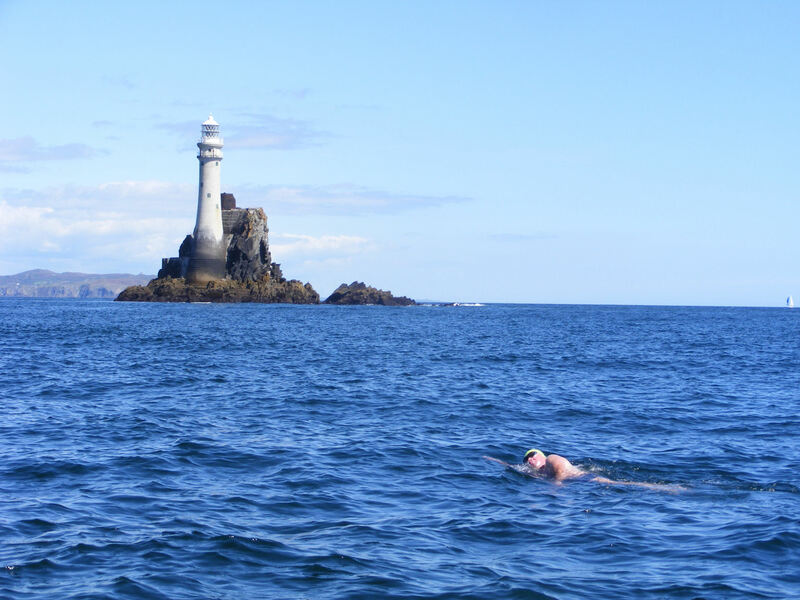 Last summer, he became the first person to swim around the Fastnet Rock, having waited four years for the right tides. When he finishes each swim, an independent observer takes a picture to verify the feat after which, he says, his body regularly goes into shock. It’s always emotional and sometimes bizarre when he reaches land. When he completed the English Channel, the head of a swimming association walked into his room while he was showering. Back in Lough Hyne, I last about 10 minutes in the water. Redmond tells me to take off the wetsuit and experience the water in the flesh. I do and it takes me about three hours, two pots of tea and a bowl of chowder to feel my toes again. He’ll do this several times a week for hours on end. Redmond is no wuss. “Doing this challenge is like trying to climb Mount Everest bollock naked, with a blindfold on,” he says. “When you’re out there, sometimes you can only see about two to three feet ahead of you. You are open to all the elements. The sea is trying to kill you. You fool yourself. The trawler "Trec'her" (ex "l'Irlandais") ran aground on February 29, morning at 6:30 about 800 meters from the coast of Île de Batz. The 20 meter long fishing vessel Trec’her went aground on Batz Island, France. The trawler sent out a distress call with the French authorities dispatching a SNSM lifeboat and a Naval helicopter to the scene. The lifeboat reached the scene and found the trawler to close to rocks to allow the lifeboat to approach. The helicopter arrived and was able to hoist the five crew off the Trec’her to safety. The men were transported to hospital to be evaluated. Authorities dispatched a pollution control vessel to the scene. The Trec’her had six tons of diesel fuel in its tanks when it went aground. 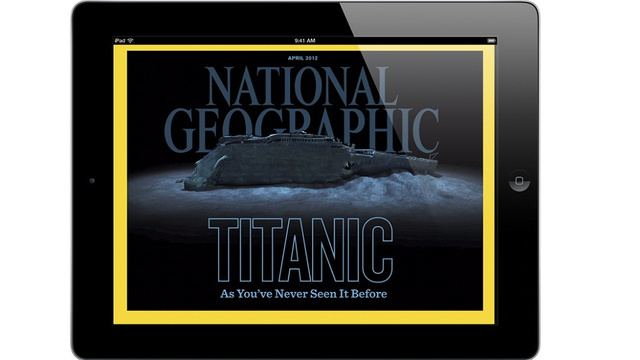 The vessel sank on March 6 after a storm swept across the area. The vessel had been laying on its side since going aground. Waves had washed away much of the equipment before the vessel sunk during high tide. Local authorities have stated that debris from the trawler has washed ashore around the island. Restrictions to fishing has been imposed as the six tons of fuel was released into the water.